Sounds like fun? I am very excited, I have so many ideas, because obviously I will create at least one recipe for each rainbow color. Blue is probably not the easiest color, I will have to mix some fruits to get the right color, but I am determined to get it done. Be sure to check back for the seven recipes in seven different colors. Now, since I have a baking blog, I will mainly get my colors from fruits. 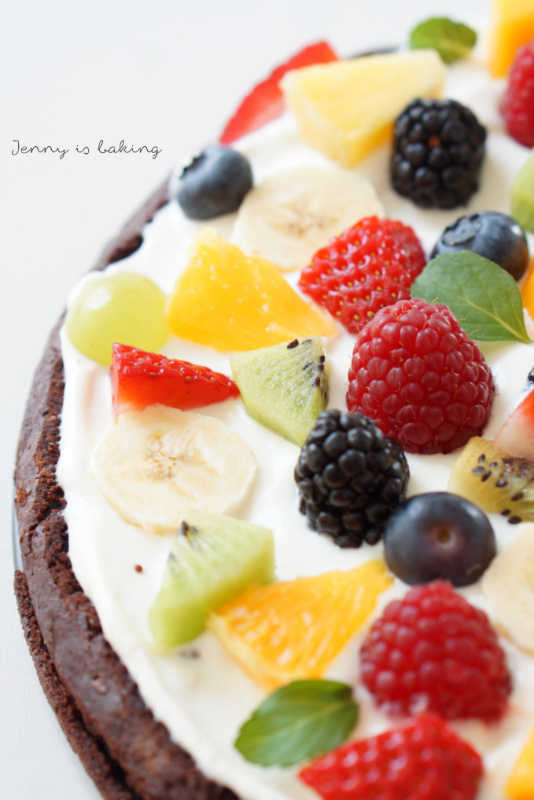 I love fruits, they make desserts so much lighter, fresher and more enjoyable. Especially at this time of the year, nobody wants to eat something heavy anymore, people start dieting for their bikini body shape. When I started thinking about this blog event, I sat down to see which fruits I could use for each color. I was amazed to realize how many there actually were! Below are some ideas of what you can use to create your one-colored recipes. Obviously, I will focus on fruits mainly, but if you want to cook, go ahead and use vegetables or spices! This list is by no means complete, but just to get your imagination going, I listed some possible ingredients. Mind you, some ingedients can be used for several colors. Blackberries will most likely create a purple dish. However, if mixed with other ingredients, you will get a pink dessert. So below some ideas. If you have some more ideas for further ingredients, please let me know! As stated, no artificial food coloring allowed, but other than that, any ingredient can color your dish! Looking forward to your recipe. Be sure to add your blog post on below inlinkz. If you have any questions, feel free to email me at info at jennyisbaking dot com. 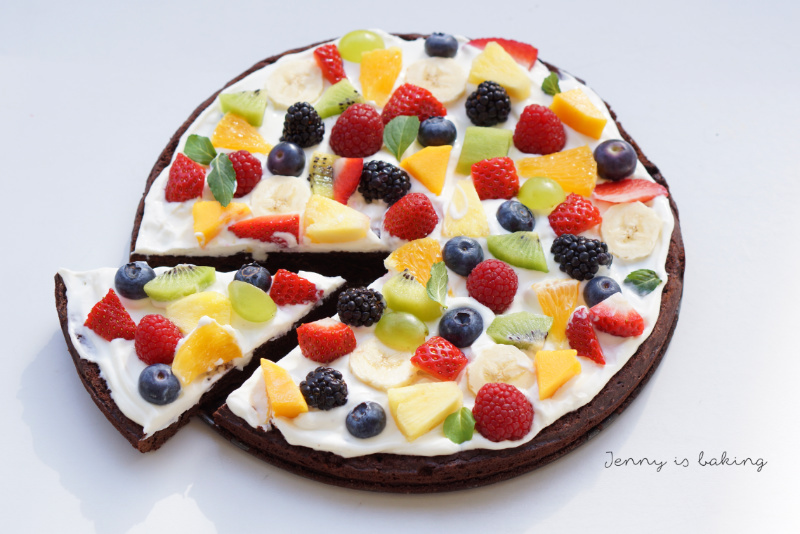 And now, finally, I would like to start off this event with a very colorful fruit pizza. Because, you know, I wanted to present ALL colors. 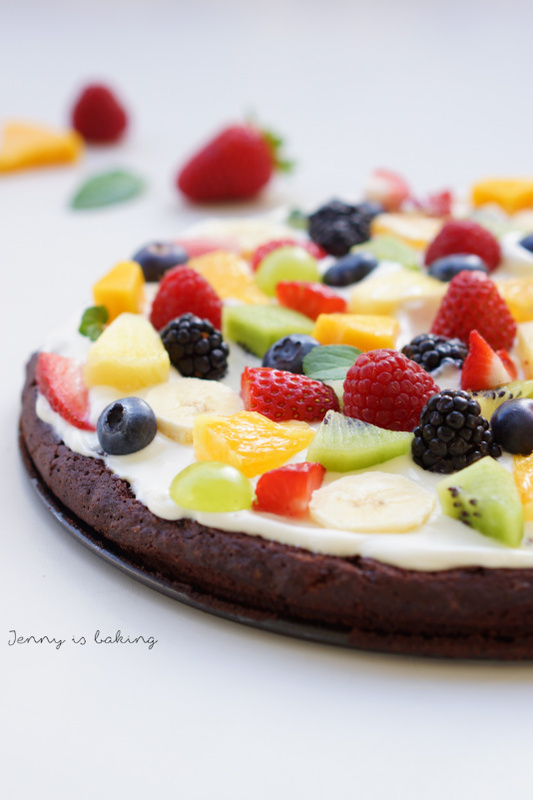 What I love about this fruit pizza is the fact that you can use different bases and also different creams. You can make it healthier or more decadent like I did. I included both options below. 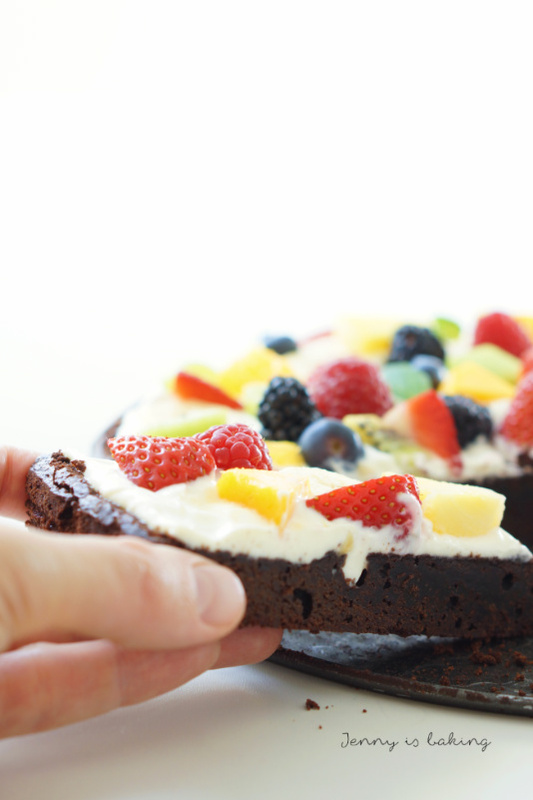 The pictures show a version with a brownie base, a cream made of mascarpone and greek yoghurt and fruits, but you can make a much simpler pie crust and omit the mascarpone. Be sure to check my comments in the recipe. 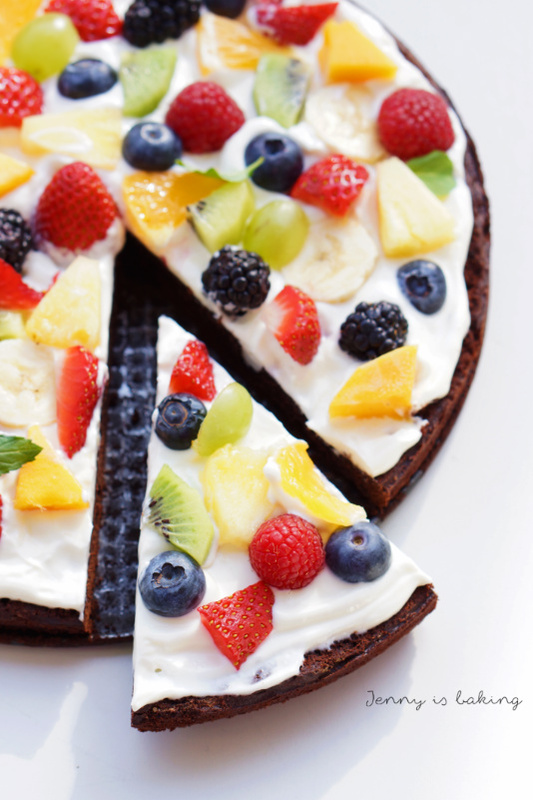 People, let’s celebrate with some colorful fruit pizza, may you add more color to your food! For the brownie base preheat oven to 180 degrees Celsius and grease a springform of 26cm in diameter. Melt the butter with the chopped chocolate on low heat on the stovetop while constantly stirring. Using a whisk, first add the sugar, then the eggs and vanilla extract. Add cocoa powder, flour and salt last. Pour into spingform and bake for about 25min, inserted toothpick should only have a few crumbs. Let cool. Best chilled in the fridge. For the cream mix all ingredients together and pour on cooled-off brownie base. Cut fruits and put on top. Garnish with mint leaves. Hallo Jenny, sehr coole Idee. Ich wollte dieses Jahr auch so eine Parade planen nach dem Motto “Eat the Rainbow” Ich finde die Idee, alle Farben des Regenbogens zu essen so gut. Das wichtigste Element einer gesunden Ernährung ist doch die Abwechslung. Da werde ich bei deiner Aktion mit Sicherheit mitmachen. Super, ich freu mich! Gib Bescheid, wenn du deine machst, da bin ich bestimmt auch dabei! Ich freue mich, danke für’s Mitmachen!